On 11 and 12 July 2016 I had the chance to finally meet a few Mahara community members with whom I had been in touch for numerous years at a meeting of the European PREPARE project. It’s been really nice to not only communicate via email, IRC or webinars, but in person. Gregor Anželj, the community’s most prolific plugin developer, came from Slovenia, Klaus Himpsl-Gutermann from PH Wien, who had written his PhD thesis on the integration of Moodle, Mahara and MediaWiki, hosted the meeting, and Andrea Ghoneim from Danube University Krems, who has been participating in a number of EU funded ePortfolio projects, joined us on the 11th. But that was not all. The following also attended (some of) the sessions (thanks Reinhard for providing all the links on your blog post): Erich Schönbächler (Teacher at Primarschule Feusisberg, Switzerland), Günter Nimmerfall (Responsible of the Service for Media and Technology, PH Tirol), Herbert Muska (ZID, PH Wien), Johannes Metscher (Ghostthinker, Augsburg, Germany), Klaus Hammermüller (Verein Offenes Lernen [Registered society “Open Learning”, Wien), Peter Groißböck (PH Niederösterreich), Reinhard Bauer (ZLI, PH Wien), and Wolfgang Greller (Vice Rector for Research and Quality Assurance, PH Wien). Settling in for the first day at PH Wien. Pictured are (left to right): Herbert, Reinhard, Klaus, Johannes, and Peter. We started on the 11th with a series of short presentations to bring everyone up to speed on the use of Mahara in the ATS2020 project, at PH Wien and PH Niederösterreich. I gave a short overview of the bigger projects that we are planning for Mahara in the coming 2 years, and we saw a brief introduction of edubreak. 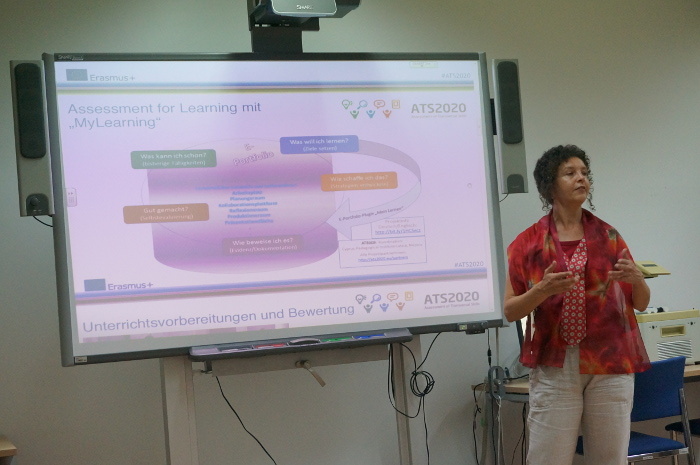 Andrea discussed some aspects of the ATS2020 project (some information in German and English) and mentioned that teachers, who were introduced to working with portfolios, appreciated having sample lesson plans available to give them an idea of how to proceed and what to cover. Students needed guidance in giving feedback and also for evaluating themselves. When the students assessed themselves they were often stricter than their teachers. While the project focuses on the assessment of transversal skills, it does look into the lifelong aspects of portfolios. Thus, they see that there is a problem when systems are connected to the portfolio as students may keep the access to their portfolio, but won’t always retain access to the other systems that were connected during their schooling. There is yet to be found a good solution to overcome this issue. Integrating systems is very useful to allow for improved work flows and avoid duplicating of data, especially when it is to be updated. However, there is no solution to download / keep all off-site data when a student wishes to do so. A “disconnect and keep all data” button is missing. Peter reported on the use of Mahara at his teacher training college. It is called “Sammelmappe” for which the English translation of “binder” doesn’t quite cover it. It’s essentially a place where you put everything that you wish to keep. Having connected it with LDAP, students have hardly any support queries. Keeping the number of passwords low is a definite plus. In the practical teacher education (“Schulpraxis”) it’s become the default to have an electronic portfolio, and students complete a reflection and development portfolio. The trend is also to only use Mahara. There, students find all necessary forms and information in regard to their study program. The same is true for the Master’s that Peter is involved in. Having everything on a single platform instead of distributed over Moodle and Mahara, is beneficial for the students who are not always very tech savvy. Over the years, they adapted their portfolio practices. In the beginning, there were a lot of reflections. This became a huge task for faculty to provide feedback as they often have many students. Thus, they dialed back on the number of reflections and now have them only for milestones. Peter walked us through one of his portfolio pages that he had set up for the semester tasks. He mentioned that he uses blocks that automatically retract for tasks that have already passed, and uses regular blocks for the currently active task. That’s a neat way of highlighting the active task without much effort. Peter doesn’t use templates for the portfolios, but leaves it up to the students how they want to present their learning evidence. They see the setting up of the portfolio as creative process and don’t want to narrow that down for the students. While his students submit written reflections, he likes giving feedback via video as he can point out the items that he’s referring to in the video more easily and can also show quickly how to do something in Mahara if needed. What was especially interesting to learn is that private feedback is often sent via email rather than put on the page as private feedback. It seemed that the sending of mail was easier for that. Public feedback was left on the Mahara pages though. 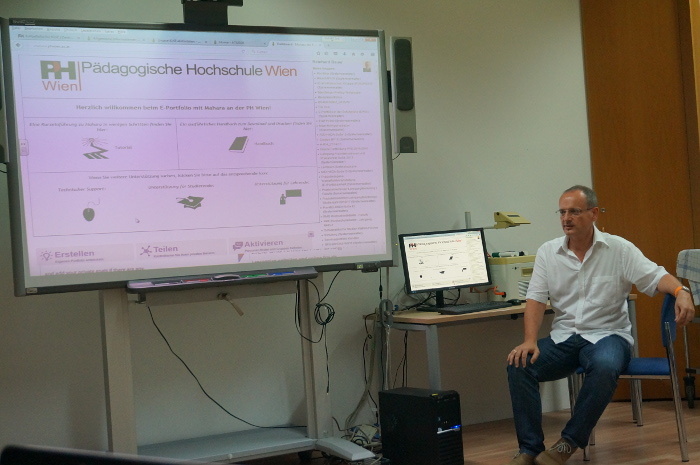 Reinhard gave an overview of the use of Mahara at PH Wien. As so many of us know, he did re-iterate the fact that the task design is crucial when working with portfolios and especially electronic portfolios. Many portfolios that he sees are just text or PDF documents uploaded to Mahara. That is just one step away from a paper portfolio. How can this be changed? Could one possibility be edubreak, which we’ll see later on? Faculty do struggle with the vast amount of reflections especially when they have lots of students. Therefore, students, like at PH Niederösterreich, don’t reflect on everything, but are more discerning to decide which learning evidence should be reflected on, which shows growth the best rather than reflecting on everything. While they do want feedback from faculty, they can’t always get it due to the number of students in a class. They also work with peer feedback and students learn to find positive aspects so as not to point out only negative things. Reinhard mentioned that sometimes portfolio reflections don’t convey the truth about what actually happened because students ask themselves what their instructor might want to hear or see. To overcome this behavior, changes in the culture around teaching and learning as well as giving feedback would be required. A big challenge that PH Wien has is to find a good balance between “Sammelmappe”, i.e. storing of the evidence, and reflecting on evidence that illustrates learning well. A portfolio is not a backup / archive of all the things that students have done, but a selection of the best evidence that illustrates learning. These pieces should then be highlighted in reflections and discussed further. I think that other pieces of evidence could form additional context, but may not need their own reflection. 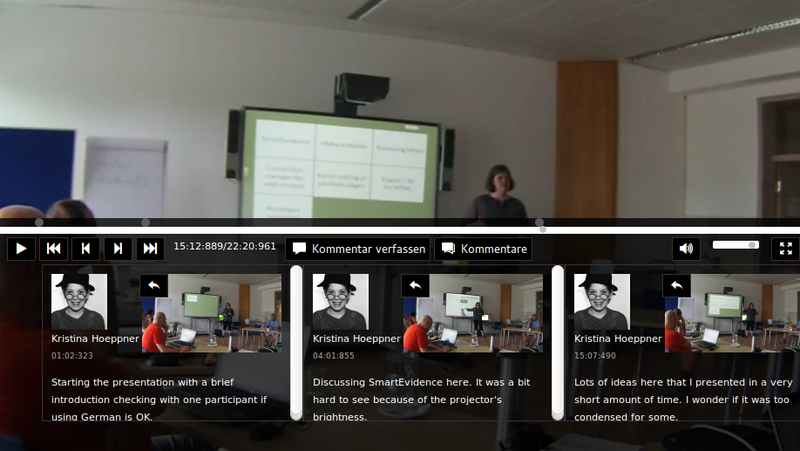 That’s why I like the concept of the Mahara pages: You do not need to reflect / show only one piece of evidence, but you can place multiple pieces of evidence on a page and reflect on all of them at once and show the connections between them rather than looking at each evidence individually. Being a teacher training college, PH Wien works closely with schools on a number of projects. One of which is KidZ (Klassenzimmer der Zukunft) Schaufenster [classrooms of the future showcase]. The project brings together best practice examples of how schools work with innovative learning and teaching methods as well as digital tools. In some cases, the schools and their portfolio implementations are also researched more closely. Some schools who haven’t had much experience showcasing their work in a portfolio received assistance by PH Wien in presenting their content. It is great to learn that this showcase encouraged a number of schools to explore portfolio work themselves and to meet online to discuss their portfolios and how to improve them. Technology is still a hurdle for students and teachers at times. Some even argue for the old paper-based portfolio as they would have something tangible. However, the electronic portfolio gives them the freedom not having to carry crates of paper portfolios everywhere. It will be interesting to find out more how technology can support students and teachers better, what improvements they’d like to see in particular and what impact these will have when implemented. 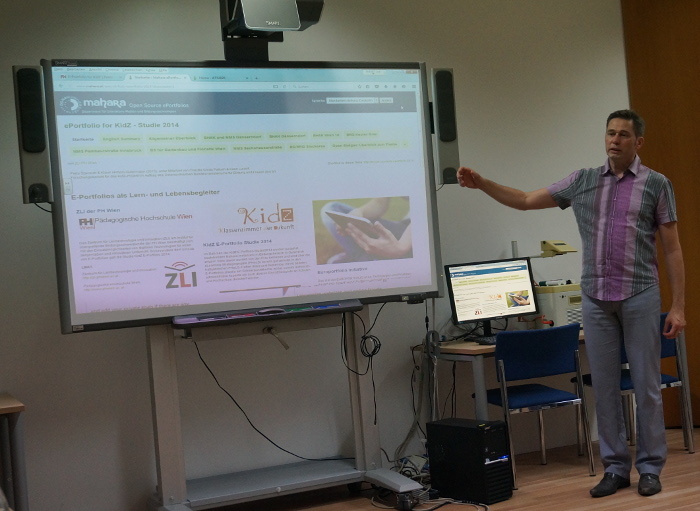 Johannes gave a presentation on edubreak®campus, a social video learning platform developed in Germany. It is being used in the PREPARE project alongside Mahara. The platform, which is built on Drupal, allows teachers to prepare activities to which students upload videos. These videos can then be commented on in edubreak and the comments are overlayed on the video and easily accessible for viewing and further feedback by anybody who has access to the video. Edubreak is already used successfully in trainings for table tennis coaches for example as the coaches-in-training can analyze the video, give feedback and learn how they can improve on their feedback. We recorded my presentation on upcoming features in Mahara, our big project ideas, and then uploaded the recording to edubreak. Below, you can see what comments look like in the platform using the new HTML5 player. By using a video platform on which learners and teachers can engage in providing each other specific feedback, it is hoped that multimedia evidence becomes more accessible and that giving feedback on it becomes easier as viewers can jump to the individual feedback directly. When trialled at PH Wien, initially only a few students were willing to be video recorded and then have their videos made available for the tasks. However, once other students saw the power of reviewing their actions, they all took the opportunity to be filmed and then viewed their videos in edubreak. At the heart of the PREPARE project is the promotion of reflective practice in the training of teachers using ePortfolios. By combining edubreak with Mahara, the researchers are exploring how a video and reflective learning environment can foster competencies in the areas of reflection and teaching as well as transfer and exchange of knowledge and practical experiences by analyzing the learning outcomes closely through a learning analytics lens and making improvements in the learning environment accordingly. On Day 2 of our get together, we explored how edubreak and Mahara could be used in conjunction by establishing personas as well as looking at technical implications of the integration such as authentication, transfer or linking of content and displaying videos and their comments in Mahara to make the experience as seamless as possible for the learners and also teachers. The project team has more thinking to do and also trialling on how best to achieve the work flow and what is possible with web services between Mahara and edubreak. This may be one of the first projects to use the new connection manager that will be available in the next version of Mahara. Since it has already been merged into the master code, the team can start looking into it and give us feedback on its usability. The connection manager shall make hooking up external systems to Mahara easier so that they do not need to be configured in the code, but via a web interface. I enjoyed both days very much as they gave me the opportunity to meet researchers in the area of ePortfolio practices, discuss their projects with them, learn about what goes well and what could be improved, as well as discuss the integration with edubreak, a social video platform, that can be beneficial for student learning and reflecting by them being able to easily annotate video content. As usual, time flew by very quickly, and after two days it was time to say goodbye to a great team whose progress I will follow. Seeing more integration projects develop will give us more insight into how well various systems can be connected to Mahara and what issues people encounter when they want to export or keep their portfolios offline and how we can circumvent them. You can find the summaries of the two days from the perspective of Reinhard and Johannes in German.